Our Lockout Cabinets are constructed from heavy duty mild steel which is then powder coated with a red textured finish. 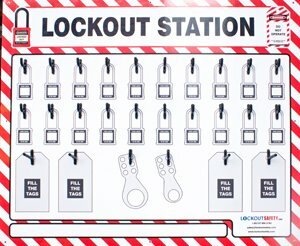 Lockout Cabinets have integrated louvre panels for Lin Bin storage and also a standard Shadow board for 50 Padlocks and additional shadow boards for LOTO tags, permit holders (Customisation can be applied). Our standard Shadow Boards are manufactured from high grade aluclad material with hardened PVC hooks to hold Padlocks and other LOTO equipment (customisation can be applied). For further information visit www.lockoutsafety.com. 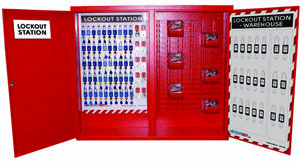 The Lockout Safety LOTO Cabinet is unique in that it incorporates both shadow boards and also Lin bin storage for all your LOTO consumables. These cabinets come as standard size 1100H X 1200W X 350D. We can incorporate a shadow board with your company logos in the cabinet. Enhance your LOTO procedure with these unique LOTO cabinets. The Shadow Board is manufactured from rigid Aluclad. The red and white border ensures that the station is highly visible wherever mounted. Shadow boards include graphics of equipment, making it easy to tell at a glance what’s missing from the station. Boards are available in 10, 20,50 & 100 Lock stations or we can design to suit your specific requirement. With plenty of storage for padlocks, hasps, tags & Valve Lockouts, this wall-mountable Shadow board is great for any Facility large or small to enforce LOTO effectively. Corresponding shadow images of each device on the station aid easy inventory checking and indicate where to replace items. We can supply this station either empty or with the relevant equipment, please specify on your enquiry. If you have any queries in relation to the Lockout Cabinets & Shadow Boards that we supply, please do not hesitate to contact us by email or by phone at 057 8662162.